Manufacturer of a wide range of products which include refractory anchor. Stainless steel anchor available in y u v zig-zag etc section. Material mostly used to make anchor aisi 310 high nickel and stable to high melting temperature. It is also available in other shape. We can produce same as per requirements. 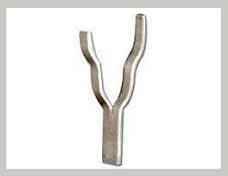 We are specially manufacture anchor as per requirements. Looking for Refractory Anchor ?